SOMETIMES one person’s trash becomes another person’s treasure — even when they are separated by 1,300 miles. That was certainly the case with the 60 tons of high-end tile that last month ended a three-year odyssey by traveling from this gritty industrial hub west of New York City to New Orleans, where residents will use them to rebuild homes destroyed by Hurricane Katrina. The journey of the tiles was made possible through persistence, generosity and good timing, and was an example of how building-supply companies, environmental groups and community activists can work together. Their cooperation may also provide a template for ways to get building materials destined for the dump to people in need, and may prove timely for suppliers trying to shed excess inventory in a slowing construction market. The trek to New Orleans began by chance at a Christmas party in 2005. Nancy Epstein, the chief executive of Artistic Tile, with seven stores and a distribution center in Secaucus, met Nancy Biberman, the president of the Women’s Housing and Economic Development Corporation, a nonprofit group known as Whedco that was building affordable housing in the South Bronx. TEAM EFFORT From left, Paul Eisemann, a contractor; Jon Cramer, an energy efficiency consultant; Debbie Grunbaum of Women’s Housing and Economic Development Corporation; and Gerard Esmail of Artistic Tile have collaborated to get leftover building materials to projects where they can be used instead of discarded. Ms. Epstein offered to donate 120 tons of older and discontinued ceramic, concrete and porcelain tiles to Ms. Biberman for her 128 apartments. Unlike many commercial developers, Ms. Biberman did not need large quantities of similar tiles and could use Artistic’s variety of small lots. Artistic, meanwhile, could reduce its inventory taxes and avoid paying to dispose of the tiles. Yet after Whedco placed tiles in bathrooms, kitchens and common areas this summer, 60 tons — worth about $250,000 — remained unused. Much of it sat outside Artistic’s warehouse on pallets, some in open boxes that exposed ceramic moldings, finished crowns and tiles costing up to $30 each. Another load sat so long in a trailer nearby that its legs had sunk into the asphalt. Serendipity ensued in the form of Paul Eisemann, who refurbishes brownstones in Brooklyn and who volunteers in New Orleans, where he teaches home-building skills. With the hurricane debris largely cleared and the frames and walls of new homes going up, Mr. Eisemann and community leaders in New Orleans turned to outfitting bathrooms, kitchens and other rooms. Back in Brooklyn, Mr. Eisemann had been speaking to Jon Cramer, an energy efficiency consultant, about how to get donated construction materials directly to communities along the Gulf Coast. Many nonprofit groups, like Habitat for Humanity’s ReStores, collect construction materials, but then resell them in stores to raise money. Their task was daunting. In New York, few warehouses had the space to store materials before they were shipped. Transportation costs were skyrocketing. They also had to verify that recipients would use the materials properly and promptly. But Mr. Cramer persevered. He spoke to Justin Green, who runs Build It Green! NYC, a nonprofit group that sells salvaged construction materials. Mr. Green’s warehouse in Astoria, Queens, was packed, so he had to turn down an offer of tile from Whedco, which wanted to donate what remained from its construction. Mr. Cramer and Mr. Eisemann seized the chance to put their plan to work. 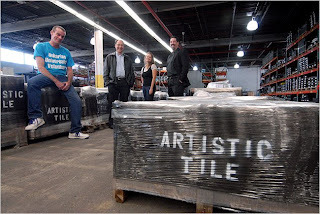 They learned from Artistic that more tile — enough to fill at least four tractor-trailers — was sitting in Secaucus, too. Mr. Eisemann contacted Mary Croom-Fontenot, executive director of All Congregations Together, an alliance of religious groups in New Orleans that has rebuilt 142 homes with volunteer labor and donations. Her group, along with Lowernine.org, another nonprofit group in New Orleans focused on rebuilding homes, was excited about the prospect of getting high-quality tile. Still, the tiles were two days’ drive from their ultimate home. So Mr. Eisemann called the Rev. Scott Sammler-Michael, minister of the Accotink Unitarian Universalist Church in Burke, Va., where he runs the TUUL-Belt Ministry, a volunteer program. Mr. Sammler-Michael had taken some congregants to New Orleans to help in the rebuilding effort. His group offered $3,000 to pay for one tractor-trailer load of tile to be shipped to Louisiana. Before he could write a check, a New Jersey trucking company that did not want its name publicized agreed to haul the first load without charge. Two trailers picked up the tile in October. To ready the tiles for shipping, three workers at Artistic’s distribution center spent three days repacking the first 47,600 pounds of tile. The tiles were sorted, crated and shrink-wrapped and filled a couple of dozen pallets. “We want to make sure it goes to a good place,” said Gerard Esmail, the operations manager of Artistic’s warehouse. Mr. Eisemann and Mr. Cramer are now focused on making sure the remaining two-thirds of the tiles end up in New Orleans.